The table below shows the average progress of children at Hollins Grundy compared to children with similar prior attainment nationally. 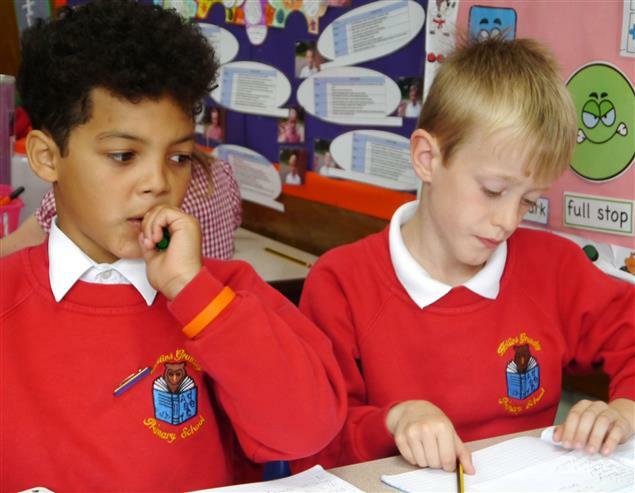 A positive score means children at Hollins Grundy have made more progress than children at similar schools. A score of zero means children at Hollins Grundy have made the same progress as children at similar schools. A negative score means children at Hollins Grundy have made less progress than children at similar schools. The table below shows the percentage of children who met the new expected standard in this year’s end of Key Stage 2 assessments both at Hollins Grundy and nationally. In reading, maths and grammar, punctuation & spelling children have taken the new national SAT tests. The result of the test indicates whether children have met the new expected standard. A scaled score is a score derived from their raw score in the test. A scaled score of 100 or more means that the child has met the new national standard in the test.